Their data currently consists of 26 separate systems, connected in various ways. Oracle Marketing Cloud Eloqua, BlueKai and Maximiser from Oracle and Salesforce from salesforce.com are just some of these systems. In addition we’re having to access and integrate with data from Magento, their website and Eventbrite for event registration and ticketing. While their data landscape is complex, the integration is achievable and not as huge an exercise they thought earlier this week. Regardless of the type of campaign i.e. a single group of specific people or a group of people based on a range of filters across various data sources, Segments is your starting point. The Eloqua Campaign Canvas provides an intuitive drag and drop interface that allows you to quickly and easily design the expereince you want to deliver. With a range of Decision and Action steps you can route campaign members in varying way based on their Digital Body Language. We built 12 different campaigns over two days. They varied from new customer on-boarding, lead nurturing, abandoned cart re-engagement and more. 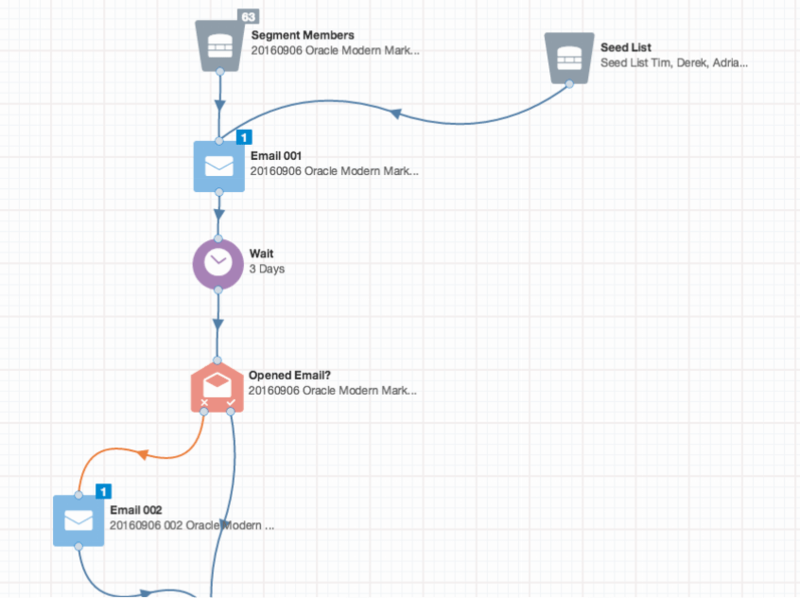 When determining which data is required for Eloqua to deliver a campaign, I find it easiest to use the Campaign Canvas. By planning the experience you want to deliver and building that experience on the Campaign Canvas, you save time but you also quickly identify the data sources needed for various steps with the campaign. The audience building process for each of these campaigns was dynamic. In other words a set of filters were developed to check specific fields, generally from the CRM. The timing for synchronisation between Eloqua and Salesforce will be every few hours and some will be set to once a day. Combined with specific delivery time of emails across multiple time zones they will be in a position to deliver a very tailored and unique experience. This client has moved from an email marketing platform to Eloqua, a marketing automation platform, that’s a big jump in functionality and options. Much of the discussion across these two days was helping them appreciate what was now possible and the fact that it could be done automatically. To “design for automation” means to factor into the creative and copy development process considerations that allow for a single email to have dynamic parts based on the individual details you have against each single contact or person. The creative development process needs to factor in their new ability to tailor messages in a much deeper fashion than with their previous email marketing platform. It means being able to present specific copy that relates to e.g. a person’s job category or their industry. This can play out to mean that a single email may have hundreds or even thousands of possible variations because each email is tailored to each person based on their unique data. When you provide a brief to your creative team or external agency, they need to understand how Marketing Automation works so they can accommodate this in the creative. As an example, this client has a current five step email campaign that delivers five messages to people should they take up a free 21 day trial of an online solution. While we could have done a simple “lift and shift” of this campaign from their email marketing platform to Eloqua, there’s so much more we can do to personalise the journey for these prospective customers. The easiest step was to check to see if the prospect opened each email, if not, we sent a repeat with a few changes. The next was to review the various calls to action in each email and then look at ways to understand if the person actually acts on the calls to action. This is more than checking a simple click through. In this specific campaign, people provide their credit card details to gain access to the free 21 day trial, however the card isn’t debited until the end of the trial period. How do we interpret the behaviour of the prospect that doesn’t open any of the five emails? This caused some robust discussion. The solution was to evaluate the frequency at which the person logged into the online portal they had just provided credit card details for. If this showed activity, it perhaps just meant that email just wasn’t their thing. Making decisions in data silos is dangerous, especially when you’re trying to make decisions based on human behaviour. What about the people who cancel their subscription within the 21 day period? Assuming the content is not relevant to a person who has just cancelled their trial subscription and your legal team don’t see this as an “opt-out”, there’s room to drop them into a nurturing program reinforcing the value of the product or service. By carefully evaluating the “journey”, albeit five emails over 21 days, we managed to enhance the experience dramatically. We graduated from five canned emails to a far more personalised experience utilising insight from the person’s Digital Body Language and live data feeds from the CRM. Remember, all of this is done “on-the-fly” while the campaign is live. Plan the experience (campaign) you want to deliver and carefully consider data sources you need in order to personalise each step. Brief your agency well so they’re clear on the creative and copy needed. Factor in synchronisation times between systems, some data will need to be almost real time and some data can be daily. Review the experience and acknowledge that some people will not always do what you want or expect them to do, plan for this and have a campaign to engage these people e.g. a nurturing campaign. It’s easy to focus only on the positive e.g. the person will click on the offer, the person will submit the form. Take time to consider how you want to talk to people when they don’t do as you expect. Eloqua + CRM = Success	“Why?” is the right question when “because” is the answer.